There's no question this cub is Canadian. While most Canadians are bundling up and preparing for a long weekend indoors, one young Canuck couldn't be happier to play in the cold and snow. The Toronto Zoo recently announced a major milestone for one of their new cubs. Their unnamed female cub just turned three months old. To celebrate, the zoo introduced the young cub to the snow for the very first time. And from the look on her adorable face, it's clear that she enjoyed it. The cub is slowly being acclimatized to the outdoors as she currently resides in the maternity den of the zoo's polar bear exhibit and is not yet on view to the public. But she is on view for this video posted to Twitter by the zoo! 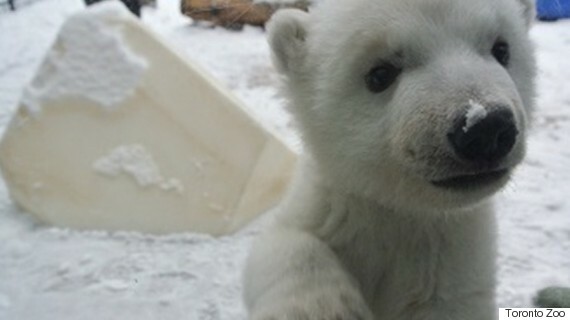 According to a press release, the cub is now 16.5 lbs, and eats five times a day. While she still receives formula, meat is slowly being added to her diet. While a date for the bear's public debut has yet to be revealed, zoo officials say they will let fans know before the day approaches. The zoo recently announced weekend viewings for their four white lion cubs and are planning to debut their award-winning panda cubs in March. Polar Bears In Churchilll, Man.